Sorry is a highly original, modern crime thriller set in Berlin, Germany. It’s a novel exploring the darker side of the street, poking its narrative nose into those locations where the illumination from the street-lights just won’t reach. It’s a book set within the treacly dark margins of society, exploring notions of control and freedom, memory and shame, guilt and atonement, revenge and forgiveness. Mostly, it is a story of victimhood and abuse. 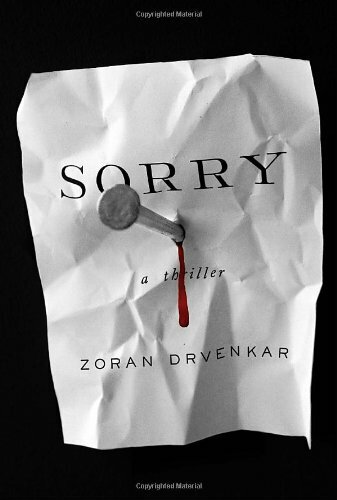 Zoran Drvenkar’s unflinching study of the "cycle of abuse” is excellently and movingly wrought. Sorry has all the ingredients to make it a compulsive read. It’s slick, chock full of twists and turns, and dripping with narrative thrust and intrigue. We’re sickened by the darkness of the world the characters are compelled to inhabit, and yet we want to know more about it. Like John Connolly’s Charlie Parker novels, this exploration of “sick people who destroy souls” both attracts and repels. But what sets this work apart from the large swathes of crime thrillers which hit the shelves every week is the language. Like Connolly, Mr. Drvenkar manages to find a murky kind of poetry in the shadows, and the shifts in narrative perspective make for a highly unsettling experience for the reader. The opening section of Sorry is told from a second-person perspective. We’re used to second-person narration from song lyrics, from love ballads, but right from the first line here, we’re shunted right out of our comfort zone: “You’re surprised how easy it is to track her down.” Immediately, we’re drawn in. Immediately, we’re made to feel somehow complicit. The significance of mirrors, of being able to look oneself in the eye, is crucial to the narrative. Guilt and shame haunt many of the characters. The desire to make amends, or to gain vengeance, forms the thrust that drives this story forwards until it reaches its terrifying climax. As a counterpoint to “you” we’re presented with four childhood friends who are bumbling through their twenties without really making much of an impact upon life. Until one of them has a moneymaking idea which will change them forever. Quickly, the four become embroiled in a dangerous game that has far more players than they’d previously anticipated. But at the heart remains “you.” “The mystery is like a house with walled-up windows and only one locked door. There’s only one way into the house,” and “you” are the key. Eventually, we start to learn something of “your” backstory. The abuse that has been smashed into “you” in childhood, when “you” and your best friend played at Butch and Sundance. Mr. Drvenkar provides no answers, but what’s important is the fact he raises the question. By addressing his villain as “you,” he inspires empathy where usually there would be none. From the darkness, Zoran Drvenkar tries to find some kind of light. A. J. Kirby is the author of Bully and The Magpie Trap and is an award-winning short-story writer.